Steeplechase Park founder George C. Tilyou famously said “If Paris is France, then Coney Island, between June and September, is the world.” Over the past few weeks, we’ve fielded queries from around the world: When does Coney Island close? What’s open in September, October, etcetera? 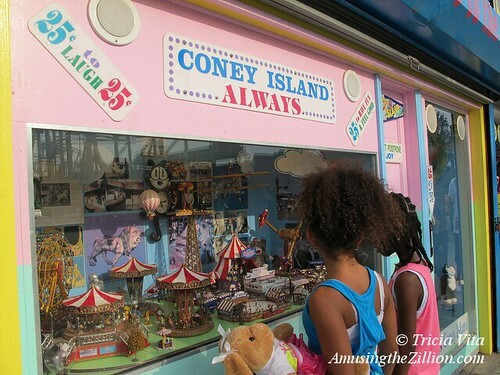 Nowadays, Coney Island’s season for amusement rides, games and attractions extends from Palm Sunday till the last weekend in October. The New York Aquarium, Nathan’s Famous, and a few other restaurants and shops in the amusement district remain open through the fall and winter. 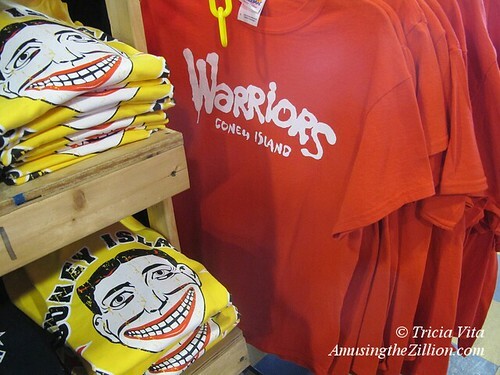 Back in 2010, ATZ wrote a guide to off-season Coney titled “Coney Island After Columbus Day: We’re Still Open!” Here’s an updated version for this year. After Labor Day, the majority of Coney’s rides are open weekends and school holidays (Rosh Hashanah, Sukkot and Columbus Day) through the end of October –this year (2013) the last day is Sunday, October 27. [In 2015, it is Sunday, November 1st.] Weather permitting, of course. Schedules may vary at Deno’s Wonder Wheel Park, Luna Park, the Cyclone and Scream Zone, 12th Street Amusements and the Eldorado Bumper Cars. The Eldorado is an independently-owned, indoor attraction and stays open after the other rides close. We recommend checking the parks’ websites and the official Coney Island twitterers list for up-to-date info and phoning ahead if the weather is iffy. Hours are generally 12 noon until 6-8pm, and sometimes until 10 or 11 pm on September weekends, but vary depending on the weather and the crowds. Closing is much earlier than in the summer season, when the parks may be open till 1am. The traditional opening day of the season is Palm Sunday, a holiday with a date that changes every year. In 2014, the parks will officially open on April 13th. (In 2015 and 2016, Palm Sunday is early– March 29 and March 20, respectively.) Coney Island’s amusement rides operate on a daily schedule from Memorial Day Weekend through Labor Day. Check the websites of the parks and attractions for seasonal hours or phone ahead. 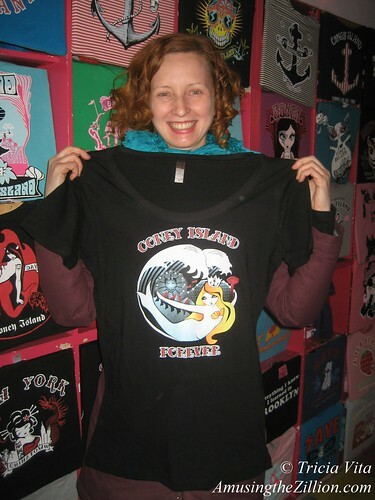 Coney Island USA features an array of events during September and October including the 29th Annual Coney Island Tattoo and Motorcycle Festival (September 13-15) and the Coney Island Film Festival (September 20-22). Check the calendar of events for October’s Creep Show at the Freak Show and Haunted Sideshow and other special events during the year. Fred Kahl’s Scan-O-Rama, a 3D portrait studio, will be open most Saturdays, from 12-5pm. Update: CIUSA’s Freak Bar and Gift Shop and Coney Island Museum will be open most Saturdays and Sundays 12pm-5pm during the winter. The New York Aquarium‘s Fall/Winter/Spring hours are 10am–4:30pm, with last entry at 3:30pm. Exhibits include Conservation Hall and Sea Cliffs, where you can see penguins, walruses and sea otters being fed. While the aquarium is still recovering and rebuilding from the devastation of Superstorm Sandy, admission fees are reduced to $9.95. On Fridays from 3pm, admission is pay-what you-wish. The historic 90-year-old Riegelmann Boardwalk is open year round and if you traverse its 2.7 miles from Sea Gate to Brighton, you’ll meet walkers, runners, bicyclists, parents with strollers, neighborhood folks out and about, as well as tourists from around the world. 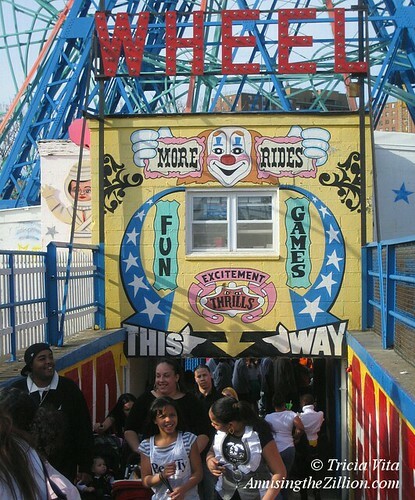 The Coney Island History Project offers 1-1/2 hour walking tours of the amusement district -“past, present and future”–including stops at the landmark Wonder Wheel, Cyclone and Parachute Jump and lesser known treasures. Tours are offered year-round, weather permitting. Paul’s Daughter, established as Gregory and Paul’s in 1962, is open daily through the end of October. Paul Georgoulakos, 84, the Boardwalk’s oldest operator, can frequently be found at the clam bar of his family’s eatery, which celebrated its 50th anniversary last year. Located at West 10th Street near the Aquarium, the store offers counter service, a clam bar, and an al fresco bar with beer on tap. We recommend the raw clams, fried calamari, and french fries. Ruby’s Bar and Grill is open daily through Halloween, co-owner Michael Sarrel tells ATZ. 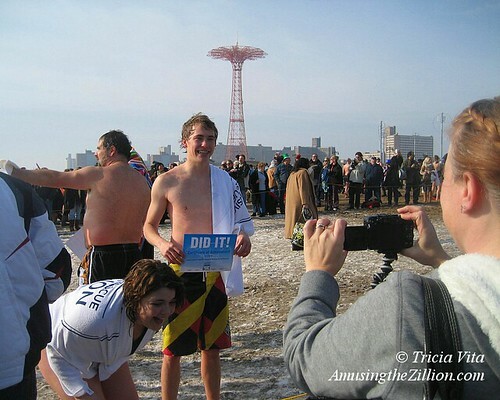 It’ll be weekends only–most weekends anyway–from November 1st through January 1st, which is a big day on the Boardwalk due to the Polar Bear Plunge. After New Year’s Day, Ruby’s will close till mid-March. Drop by Ruby’s Facebook page anytime to check seasonal hours and whether or not they’re open when you plan to go. Brooklyn Beach Shop, which offers private label T-shirts, hoodies, blankets and beach gear, is open daily through the end of October. Weekend hours are planned for the rest of the year, depending on the weather and the crowds. At Tom’s Coney Island, breakfast including their delicious pancakes, is served all day. The restaurant has become a local favorite for brunch and lunch since Superstorm Sandy, when it was one of the few places able to open after the storm. 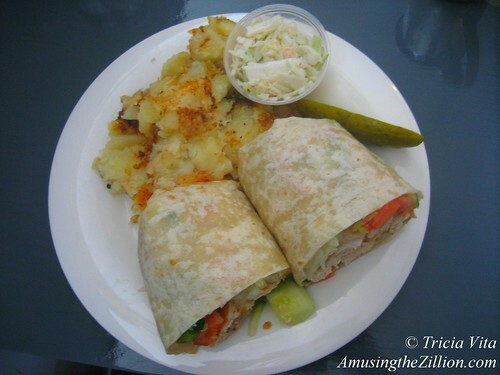 A variety of omelettes, sandwiches, wraps, hamburgers and vegie burgers are also on the menu. “We will be staying open through the winter from 8-5, seven days a week,” owner Jimmy Kokotas tells ATZ. “We are currently open 8-7 till daylight savings begins.” The Boardwalk outpost of the popular Prospect Heights diner celebrates its first anniversary later this month. 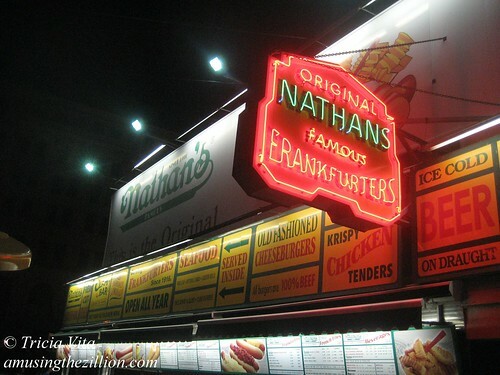 Founded in 1916, Nathan’s Famous original location on Surf Avenue at Stillwell is a year-round tourist destination. People say their world-famous hot dogs taste better here than at any of the locations of the franchise. Throughout the year, the Surf Avenue store is open daily 8am till 1am, and until 2am on Friday and Saturday. The Nathan’s at the corner of West 12th on the Boardwalk is open seasonally. Williams Candy is one of our favorite places in Coney Island. 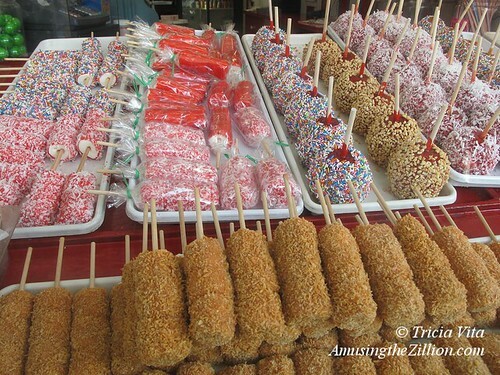 The 75-year-old Mom-and-Pop shop is next door to Nathan’s Famous and is open year round. Hours are 9 am till 7 pm during the off season. The shop stays open late when Coney is in full swing. Williams also has a delicious looking website where you can order marshmallow sticks, candy apples and other treats online. On Stillwell Avenue directly behind Nathan’s is Coney Island Beach Shop, which has been selling T-shirts and beach gear at this location in Coney Island since 2002. Year-round hours are 10:30am-4pm. Across the street from Nathan’s, in Thor Equities new retail building, the pop-up shop Wampum packed it in after Labor Day, but the rest of the stores are open daily through October 30, according to store personnel. With the exception of candy mega chain It’Sugar, which will be open year round, the rest of the stores will close for the winter. The Brooklyn Nets Shop, Brooklyn Rock, Maritza’s Souvenirs and Rainbow Shop (discount clothing) have seasonal leases through October and most hope to return next season, sources told ATZ. UPDATE: Brooklyn Rock, Maritza’s and Rainbow shop were replaced by Surf & Stillwell and a souvenir shop, also seasonal, and the NY metro area’s first Wahlburger’s, which will be open year round. 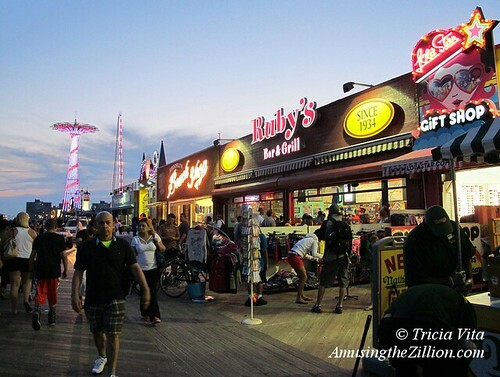 If you prefer Italian food, there are a trio of Coney Island restaurants open year round. The Surf Avenue outpost of DUMBO’s Grimaldi’s Pizzeria currently offers a slice of Coney Island history along with their pizza pies. The “Dreamland Bell” that survived the Dreamland Fire of 1911 is on display as a symbol of Coney’s comeback from Sandy. It can be seen through the storefront window by pedestrians walking on the north side of Surf. The Bell is there through September 27th. A short walk from the amusement district are two of the neighborhood’s longtime favorites– Totonno’s Pizzeria on Neptune Avenue since 1924 and Gargiulo’s, in business since 1907 on West 15th Street. I MOVED FROM BRIGHTON 2ND STREET TO FLORIDA IN 1956 BUT I STILL REMEMBER CONEY ISLAND AND THE STEEPECHASE, THE FREAK SHOWS AND ESPECIALLY NATHAN’S AND I REMEMBER THE BEST FRENCH FRIES EVER.